The train's not moving through the station. You can't drop the kids off at the pool. You're constipated, and there's nothing funny about it. If you haven't had a BM in a while, you might be feeling gassy, bloated and crampy. Your diet is usually the first target to take aim at -- increasing your fluid and fiber intake. Exercise is the next best strategy, and the ancient practice of yoga has you covered. Not only does yoga reduce stress that can cause constipation, certain positions help massage the abdomen to get things moving. Cardiovascular exercise like brisk walking and jogging is a commonly recommended strategy for relieving constipation. Cardio gets your blood flowing and heart pumping and can stimulate a sluggish digestive system. 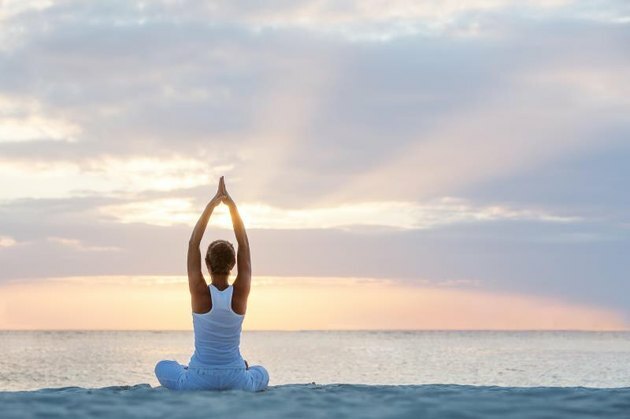 Yoga's version of cardio is a flowing sequence called sun salutations, usually used to warm up the body and prepare it for more challenging poses. If you've got 10 to 15 minutes, you can do a mini-cardio workout that should help speed up digestive transit time. How to: Do the following poses in quick succession, allowing one breath per movement, except for downward dog, which should be held. Begin in Mountain pose with your arms at your sides and shoulders pulled back. Inhale your arms up over your head. Exhale as you swan dive forward, folding at the waist and sweeping your arms out and down. Inhale to a Half Forward Fold looking ahead with your back flat and your palms on your shins. Exhale to a Forward Fold and step your feet back to high push-up position. Inhale for one count, then exhale as you lower down to Four-Limbed Staff Pose, with your elbows bent to 90 degrees and your knees and hips lifted or knees and chest on the ground for support. Inhale into Upward Dog, scooping your chest forward and straightening your arms. Leave your thighs and pelvis on the ground, or lift both off the ground for a more active posture. Exhale back to Downward Dog. Hold for five deep belly breaths. Inhale as you step forward and rise up to Mountain posture. Repeat the sequence for a total of 10 rounds. This is a calming and relaxing pose that's perfect when your tummy is feeling crummy. Twisting postures compress and massage, stimulating the digestive system and helping to relieve gas. How to: Lie on your back and pull your right knee in towards your chest. Keeping your shoulders on the floor, bring your right knee across your body. Turn your head to the right and take several deep belly breaths. Return to the starting position and repeat on the other side. The name says it all. If bloating and gas are the major symptoms of your constipated state, this pose will help. Compression of the abdominal area helps force out trapped gas and stimulate the digestive system. How to: Lie on your back with your legs extended. Bend your right knee and grasp your right shin just below the knee with both hands. Pull the knee into your chest. Keeping your left leg extended with the heels on the floor and your back pressed into the mat, pull the knee in as far as it will comfortably go and hold for several deep belly breaths. Release and switch sides. The undulating nature of this posture stretches and compresses the abdominal area, relieving gas and bloating and stimulating digestion. How to: Get on all fours with your wrists under your shoulders and your knees under your hips. Inhale as you drop your belly down, naturally lifting your chest and hips. Exhale as you arch your back like a cat, dropping your hips and shoulders and rounding your mid- and upper back. Repeat the sequence several times, taking deep belly breaths.